The basins extending north from Berthoud Pass to Winter Park on Highway 40 are some of the best backcountry ski and splitboarding terrain on the Front Range of Colorado. The basins of Current Creek, Second Creek, and First Creek contain a lifetime of exploration for the rider who wants to delve further into the backcountry and farther from the car shuttle terrain near the pass. Skins or snowshoes are needed to access these basins, and the reward for earning your turns is deep powder shots in the winter and high peak chutes in the spring. The expansive information below consolidates all of our previous Berthoud Pass North mini-guides into one page. This page contains Current Creek's Hidden Knoll and 110s, Second Creek's Ridge and Headwall, and First Creek's Ridge. These are our favorite areas to ski on Berthoud Pass. Enjoy! Interested in taking this information with you to the Pass? Check out our guidebook now available from Beacon Guidebooks. Hidden Knoll is truly hidden from view. The best places to see it are from the Postage Stamp and 110s area in Current Creek and from Mount Russell. It is situated in the Current Creek drainage below Mount Russell, and it requires an approach using skins or snowshoes to access. The distance from the hustle and bustle of the Pass means fewer people. Add to that the high quality leeward facing lines, and the great views of Current Creek and it quickly becomes a favorite of local backcountry skiers. This area is all about bowl and chute skiing! The Berthoud Pass Ditch bisects this area. The Ditch is positioned lower on the flanks of Hidden Knoll than it is on the 90s near the Pass. The skin track in brings you past the Peter Rabbit Hut and up to the Ditch. The Ditch is not flat here and you climb up it to the east or west to access the sides of Hidden Knoll. Snowmobile Access: Snowmobiles are not allowed at Berthoud Pass. The skin track departs the southwest corner of the parking lot heading west into the trees. There is a road on the left and this is the exit from the 90s. The skin track quickly splits with a west (left) line following Current Creek towards the Hidden Knoll area. The right line climbs to the 110s area. Proceed west up the skin track following Current Creek. At approximately 0.5 miles you will pass Peter Rabbit Hut. Just beyond this there is a brief climb to the Ditch. 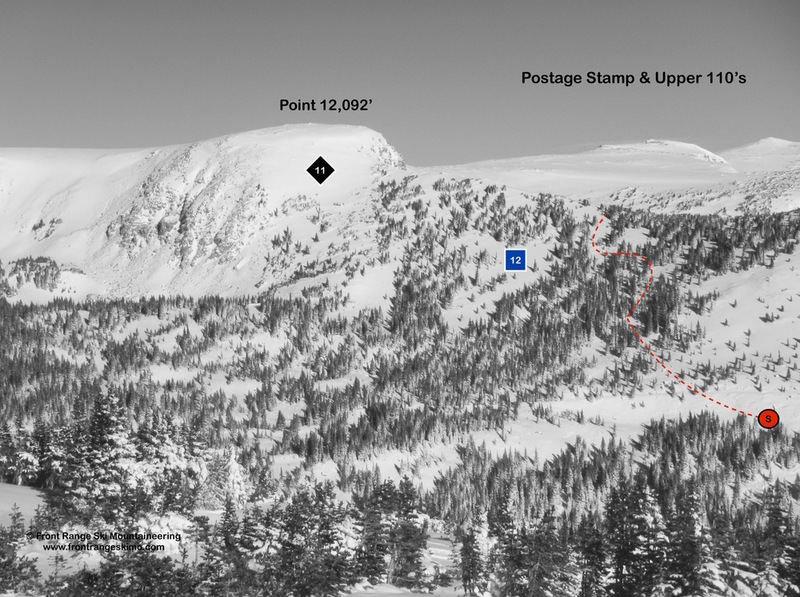 You can use the Ditch to climb left and east to the bowl below the South Chutes of Hidden Knoll or climb right and west to XYZ and Moonlight Bowl. The Hidden Knoll routes eventually bring skiers back to the Ditch. You can access Hidden Knob from the South Chutes, and there are several chutes below XYZ in the trees to the Ditch. The large cliffs above the Ditch are sometimes called the Swiss Horn. From the Ditch follow the skin track past Peter Rabbit Hut to Current Creek and then the trailhead. 1 - Halfpipe – Halfpipe is an extension of the bowl below the South Chutes of Hidden Knoll that terminates behind the knoll. On the Ditch, climb east several hundred feet and then climb steeply through the woods to the south in the open flat bowl that leads to Halfpipe and the chutes. 2 - South Chutes of Hidden Knoll – The South Chutes are east and southeast facing. This terrain is frequently exposed to the sun and this can affect the conditions and snow stability. 3 - Hidden Knob – Hidden Knob is an area unto itself. There are numerous chutes and rocks on the Knob. Access this from the bottom of the South Chutes or the bottom of Y Chute. 4 - Y Chute – The XYZ chutes and bowls are accessible by climbing Halfpipe or Moonlight Bowl to the top of Hidden Knoll. Y Chute is the steepest of the chutes. 5 - Z Chute – Z Chute empties directly into the Berthoud Pass Ditch. 6,7 - X Bowls – The X Bowls are not as steep as Y Chute and Z Chute but they are avalanche terrain. 8 - Moonlight Bowl – Moonlight Bowl is the basin below XYZ that wraps around the north side of Hidden Knoll. There is a reason why there is a route on the 110s called “Perfect Trees”. 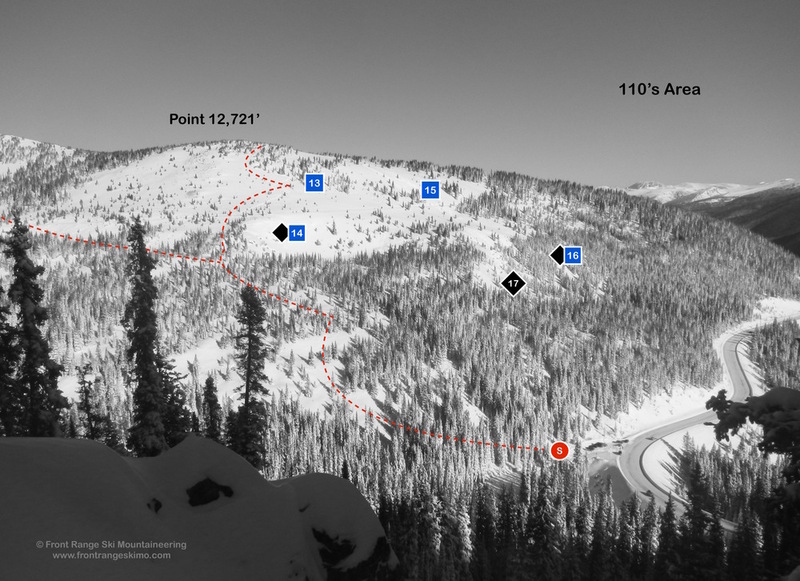 The 110s have the best tree skiing on Berthoud Pass, combined with long runs. The 110s area is also a great spot to scope out the 80s, 90s, and Hidden Knoll terrain. The 110s face east or south and snow conditions can become quickly influenced by the sun. Get here early on a powder day for laps on the best tree skiing on the Pass. The Berthoud Pass Ditch bisects the 110s area and you can use it to traverse into Second Creek to the north or to Hidden Knoll to the south. By mid-winter the Ditch may not be as obvious due to being buried under the snowfall. The top of the 110s, Point 11,721’, shares a summit with Second Creek’s north-facing routes. The 110s and Postage Stamp routes eventually bring skiers to the exit trail following Current Creek. The exit from Point 11,721’ is below the 110 Cliffs and deposits skiers on Highway 40 several hundred yards north of the Current Creek trailhead. In early season the drop to the road can be steep and rocky. Be careful on the walk back to the trailhead. 11– Postage Stamp – The Postage Stamp is the steeper and exposed high point of the 110’s area. This is not frequently skied in winter due to its high potential to slide. 12 – Upper 110s – These glades are situated between Postage Stamp and the other 110s and are a great place for skiing quick laps. This is a perfect place for low angle skiing on high avalanche hazard days. 13 – Perfect Trees – Perfect Trees have just the right pitch to give you a pop out of the snow on every turn. The southeast facing slope can get crusty by the afternoon. Perfect Trees lead to the 110 Cliffs. 14 – Tea Cup Bowl –Tea Cup Bowl is infrequently skied because this southeast-facing slope frequently holds shallow snow, and is exposed to the sun. 15 – Middle 110s – The Middle 110s are a moderate glade skiing paradise. The route drops into the steeper Lower 110’s. You can find the Ditch in the Middle 110s and traverse into Second Creek. 16 – Lower 110s – The Lower 110’s are the steeper glade exit from the Middle 110s and deposits onto Highway 40. The snow in this area can develop a crust due to sun exposure. 17 – 110 Cliffs – The 110s Cliffs are the skier’s right side of the Lower 110s. The Perfect Trees and Middle 110s can take you to these cliffs. To avoid the cliffs, traverse right across the top and back to the Current Creek Trailhead. The 110 Cliffs are wide and hold several descent lines of varying difficulty. Second Creek is a broad basin that one could spend a whole season in and discover glades, tree-lined chutes, and high alpine bowls. This basin is host to the Grand Hut Association’s Broome Hut. There is a day-use room at the Hut and it is a great spot to take in the views of the Second Creek Ridge and Headwall. It is a quick ski one mile up a well-marked trail to the Hut. During the approach to the Hut you can scope out the terrain on Second Creek Ridge before attempting to climb it. The Second Creek Ridge is the north side of Current Creek’s Point 11,721’ and is accessible from Second Creek trailhead or from routes on the 110’s. The ridge is bisected by the Berthoud Pass Ditch, but the road cut of the Ditch is less obvious here compared to the impression it leaves on Current Creek’s 80s and 90s. The western side of Second Creek Ridge is a windward slope and frequently holds shallow snow. Rock sharks, core shots, and blown edges are commonly obtained results from the skiing chutes dropping off this ridge. The closer you are to the Second Creek trailhead the more the ridge is pointed northeast and leeward facing and thus collects more snow. The Second Creek Ridge is a complex series of cliffs and chutes that are very hard to discern from the top. The snow is shallow and the objective hazard potential is high. Even the tree runs on the Ridge are avalanche terrain. If you are new to this area, spend the time to learn the entrances to the chutes from above and below. Use landmarks such as the top of the First Creek Ridge across the basin to help you determine where you are on the ridge. There is an infrequent skin track to the Second Creek Ridge that climbs southwest from the parking lot approximately one mile to the top of the knoll at 11,721’. [39.8173, -105.7821]. This path traverses east around Narnia Woods and climbs steeply to the Berthoud Pass Ditch. Look for the Ditch and use this as a landmark to know that you are level with the top of Narnia Woods. The Ditch takes a hard west turn and this is the entrance to Narnia Woods. The Ditch continues west and descends to the top of Aqueduct Drop and Core Shot. After this point the Ditch is hard to follow and it traverses the middle of avalanche terrain. Above the Narnia Woods and Berthoud Pass Ditch is a more gentle ridge with gladed trees to climb through to access Point 11,271’ and the other lines. The runs on the west side of the ridge are also accessed via the trail to the Broome Hut. The skin track to the Broome Hut is well marked with blue diamonds and poles and heads west from the trailhead one mile to the Hut [39.8264, -105.7833]. Just before you reach the hut you can break off from here and head south directly to the base of the Escape Hatch and Corner Pocket Glades. The routes from Second Creek Ridge all lead into Second Creek. Traverse skier’s right and find an existing track back to the trailhead. 21 – Narnia Woods – Narnia Woods are a delightful and steep tree run descending from the hard west turn on the Ditch. Ski to the right to avoid the cliffs at the bottom. 22 – Aqueduct Drop – The first open gully on the Ditch after Narnia Woods. 23 – Core Shot – The second open gully on the Ditch after Narnia Woods. There are small cliffs on the skier’s left at the bottom. 24 – Center Chute – The upper portion is a wide avalanche path that leads into a gully with a rock wall on the skier’s right side. 25 – Facet Factory – Facet Factory is a large and complex area between Center Chute and Blown Edge. These steep and tree-lined chutes are frequently windswept and hold shallow snow. 26 – Blown Edge – This is a rocky area that rarely fills in with snow. It is a good landmark because it is so obviously rocky! 27 – Escape Hatch – This avalanche gully is visually distinct when seen from the Broome Hut. From the top of 11,271’, drop straight north through krumholtz and tight trees to find this. 28 – Corner Pocket Trees - The Corner Pocket Trees are short but steep. They drop to a creek bed and a second round of glades leading to Second Creek. The Second Creek Headwall looms above the Broome Hut, and hosts several of Berthoud Pass’s classic couloirs. The Headwall is accessible from the Hut’s approach trail or from the Current Creek 110’s Postage Stamp. You can catch a quick view of the Headwall while driving south on Highway 40 between First Creek and Second Creek trailheads. The Second Creek Headwall holds high risk and consequential terrain. The chutes and faces of the Headwall have frequent natural slides, and there have been many skier-triggered avalanches on these slopes over the years. The spring's consolidated snowpack may provide a more predictable basis from which to make a decision to climb and ski these high lines. The approach to the base of the Second Creek Headwall follows the skin track to the Broome Hut. It is well marked with blue diamonds and poles and heads west from the trailhead one mile to the Hut. [39.8264, -105.7833]. Just before you reach the hut you can break off from here and head west directly to the base of the Second Creek Headwall. The Second Creek Headwall and routes accessed from the Broome Hut return via approach trail. 29– Corner Pocket – Corner Pocket is the straight shot from the north edge of the Postage Stamp into Second Creek. 30– Frankenstein – Frankenstein is the couloir north of Corner Pocket and separated from the Pocket by a large buttress. The chute is steeper at the top due to cornices and wind loading. 31,32 – Brides of Frankenstein – These two snow gullies are north of Frankenstein and separated from each other by a rock rib. 33 – Second Creek Headwall - A convex slope routinely forms on the skier’s left side of this slope. 34 – Hourglass – Also known as the Hallway, this coveted line is directly skier’s left of the Headwall. The terrain above the chute is convex. 35 – Headwall North – Headwall North is a similar aspect and pitch to the Second Creek Headwall itself. This is consequential avalanche terrain slides are frequent here every winter. First Creek is another prime example of the vast terrain that the Berthoud Pass area provides to backcountry skiers and snowboarders. You could spend a whole season exploring the upper and lower reaches of the drainages leading to First Creek. First Creek Ridge is the most obvious terrain in this valley as it is visible from Highway 40 and has a short and direct approach. Chimney Chute is the crown jewel of this area and you look straight at it from the parking lot. First Creek Ridge has the same north and northeast orientation as Second Creek Ridge, but is slightly lower in elevation. The similarities to Second Creek Ridge include a windswept west side, leeward and loaded northeast facing gullies, and a thinner snowpack than what you may find higher at Berthoud Pass. 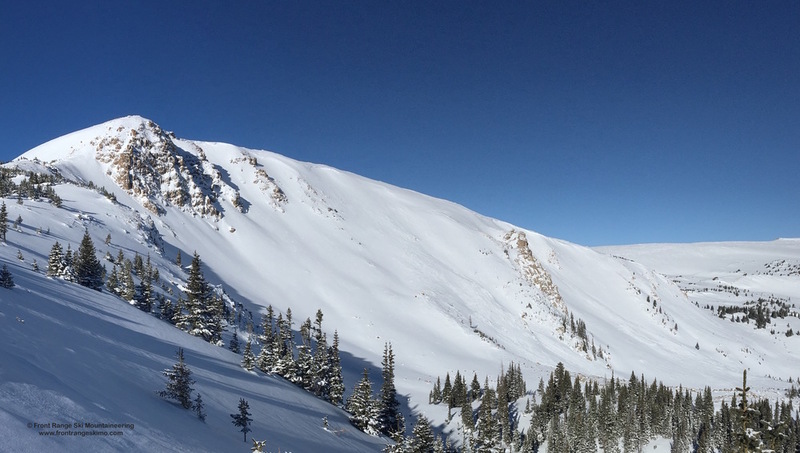 The skiing and splitboarding on the lines on First Creek Ridge are best in the early spring of a winter with a solid snowpack. You may be able to find a skin track, or the remnants of one, that climbs steeply from the south side of the First Creek Trailhead and to the looker’s left of the Parking Lot Glades. This track eventually reaches the ridge and climbs to the top of the Chimney Chute. An alternative path that may be established follows First Creek to the west and then climbs below and through the Bench Glades and further west to the saddle between First and Second Creek. Finally, some skiers access the First Creek Ridge via the approach trail towards the Broome Hut in Second Creek. The majority of the First Creek Ridge routes lead to First Creek. Cross the Creek and find a trail that quickly leads back to the parking lot. 37 – Parking Lot Glades – Parking Lot Glades are steep trees that are short but a lot of fun. 38 – Slot Trees – Slot Trees starts skier’s right of the First Creek Cliffs. There is a narrow chute in the trees at the start. 39 – First Creek Cliffs –These steep cliffs form the left side of Chimney Chute and contain several intricate and complex lines. 40 – Chimney Chute – Chimney Chute is the classic run of First Creek and stares you in the face while you are getting geared up in the parking lot. This chute is one big terrain trap. There is an alternate exit on skier’s right just above the walls of the Chimney. 41 – Chimney Chute Glades – The steep trees skier’s left of Chimney Chute are accessed by descending left around steep rocks and a ridge and then back skier’s right. 42 – Paradise – Paradise contains open turns leading into the gully west of Chimney Chute. 43– First Creek Ridge – First Creek Ridge contains various quick shots descending to the Bench Glades. The snowpack here is often thin, faceted, and windswept like the west side of Second Creek Ridge. 44 - Bench Glades – Directly north of Chimney Chute Glades and Paradise is a final pitch leading to the creek. The Current Creek Trailhead is the large turnout off of US Highway 40 Berthoud Pass Road approximately 2 miles from the summit and 9.3 miles from Winter Park. [39.8102, -105.7785] There is a parking lot on the west side of the highway next to the start of the skin track. Additionally, there is more parking just north and across Highway 40. This second lot may not be plowed after a major storm. The Second Creek Trailhead is the large turnout off of US Highway 40 Berthoud Pass Road approximately 2.9 miles from the summit and 8.4 miles from Winter Park. [39.8223, -105.7698] It is between the Current Creek and First Creek Trailheads. The First Creek Trailhead is a smaller turnout off of US Highway 40 Berthoud Pass Road approximately 3.6 miles from Berthoud Pass Summit and 7.8 miles from Winter Park. [39.8282, -105.7679]. It is between the Second Creek and the second switchback on the north-bound side of Highway 40.